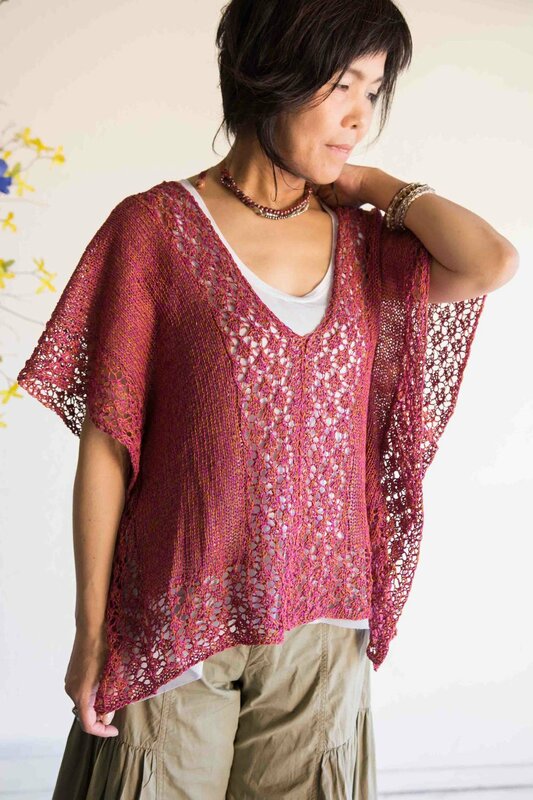 This poncho-like pullover is made by knitting two rectangles: one for the right front and back and another one for the left front and back. The two rectangles are seamed together along one long edge of each rectangle to make the center seam of the pullover, leaving an opening for the neck. This is my first design with a V-neckline. I prefer a round neck or boat neck for myself because the V-neckline has a sharp look. So I used a lace stitch pattern for a more feminine look. I also prefer no shaping with a lace stitch pattern. The two rectangles seamed together and then dropping the upper body to the sides make the V-neckline. This pullover is different from my other simple rectangular-shaped garments. I seamed 3” in from the outside edge to make the shape of the garment less boxy, and the upper arms look like sleeves. Finished Size Chest: 42 [48, 54]", Length: 22 [23 ¼ , 24 ½ ]"